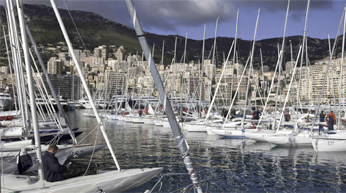 With 24 boats, the J/24 class boasted the largest fleet at the 2011 Primo Cup. Entries came from 7 countries including Monaco, France, England, Hungary, Italy, Brazil and Sweden. Amongst the entrants were Sweden’s Anna Gunnarson, and three time world champion Maurizio Santa Cruz from Brazil with J/Boats Italy’s Paolo Boido aboard, England’s HITCHHIKER sailed by Andrew Taylor and JOLLY ROGER helmed by Roger Morris, and Hungary’s NORD TELECOM SAILING TEAM skippered by Gabor Makai. Unfortunately, the wind did not cooperate and the regatta finished after only one race. On Saturday Feb. 5th, following a black flag recall, a race was finally started. Despite a slow start, Santa Cruz’s team figured out the tactics and surged through the fleet to finish 2nd in the one and only race for the regatta. The calm seas made for gorgeous sunrise and sunset photos but offered impossible conditions to finish off the regatta after a beautiful start on Friday midday.